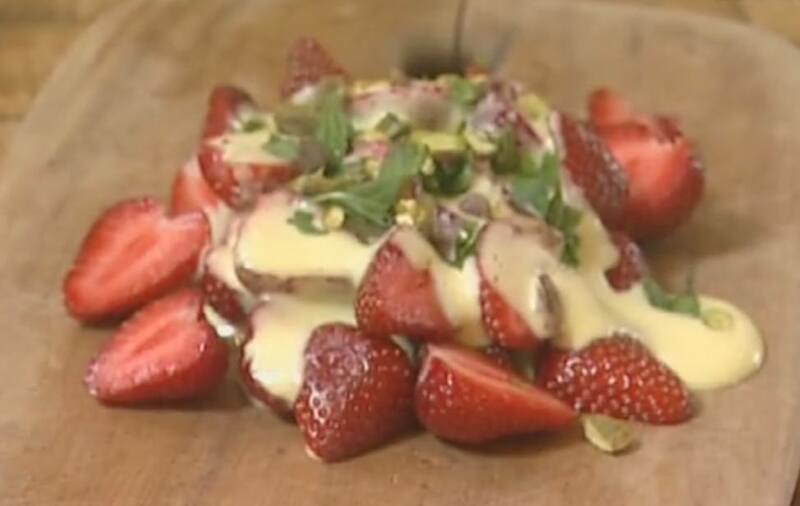 Although a little tricky, the video shows you how to make the perfect sabayon sauce to enhance the strawberries or other berry fruits in this simple but sophisticated dish. Sabayon is just egg yolks, wine and sugar whisked together and set over gentle heat from a steaming pan (Bain Marie). As well as strawberries, the sabayon sauce works well with other fruits such as raspberries or even roasted apples. Make the sabayon by whisking together the egg yolks with the prosecco and sugar over a pan of barely simmering water until light, fluffy and tripled in volume. Plate up by arranging the strawberries on a plate and spooning over the thick, light sabayon- if you like, you can glaze with a blowtorch. Finish with torn mint leaves, chopped pistachios and enjoy!